In the project, African Odyssey, we follow the life and long journeys of Black Storks (Ciconia nigra), with participation of the Czech Radio 2 - PRAGUE and its listeners. There were few initial impulses to start this extensive project in 1994. The most important of them are listed in the keynotes below, and are still valid. One of the supporting pillars of the whole project is the application of the most progressive technologies. We have a possibility to gain particular data about the whole migration route between breeding and wintering grounds with the help of satellite transmitters (PTT - Platform Transmitter Terminal), which are attached like a "backpack" to the stork's back. A quick new data processing had been developed only one year before the African Odyssey began. This technical innovation enables us to get information about a location of transmitter anywhere on the Earth's surface within twenty minutes under optimal condition. Owing to this innovation, (in combination with conventional telemetry and by improvement of the satellite systems Inmarsat M and GPS) we could, as the first scientists at all during history of bird migration studies, follow literally "step by step" one of our storks during its whole migration pilgrimage from the central Europe to the west Africa. Wide publicity is characteristic for the project African Odyssey. Regular information about the course of stork's migration is brought not only by Czech Radio 2 -PRAGUE, but also by lot's of other media. Moreover, Czech Radio 2 - PRAGUE became an organiser of scientific expeditions to Africa, from which live shots and reportages were broadcasted several times a week. Scientific data obtained by satellite monitoring and by expeditions are gradually analysed. New findings enlarge our knowledge not only about Black Storks but also about bird migration phenomena at all. These findings also refer to the world-wide connections. European nature protection of migrating birds will not be effective until dangerous sites for the migrating birds exist on their annual journey to the south and the natural environment on their winter grounds changes rapidly. In 1995 - 1999 period, 17 black storks made their way to winter habitat, carrying communication sets. One female stork had been observed repeatedly (Zuzana), another female stork had been subject to the research in four consecutive seasons Kristyna. In the beginning of the first survey season (1995/96), three black storks were equipped with the communication set. They were female stork Kristyna (the first black stork carrying a satellite transmitter EVER), female stork Zuzana, and male stork named Viktor. All the birds reached their winter habitat sites successfully, each of them choosing a different way/strategy and the winter habitat itself. Kristyna chose the "western route" over the Strait of Gibraltar, she spent the winter in eastern Senegal. On the contrary, Zuzana and Viktor flew along the "eastern route". Then, Zuzana spent the winter in Ethiopia, while Viktor resided in Chad first and then he moved to Central African Republic. Kristyna was followed on her way by the Czech Radio 2 - PRAHA expedition crew. After her winter habitat was explored, the four people crew turned to follow Viktor in eastern Chad. In spring 1996 all the birds returned to central Bohemia for their nesting season. During next season (1996/97), three black storks got on their way, they were Kristyna, Zuzana, and a new male stork named Oskar. Kristyna reached the same winter habitat, although she chose a lightly different trace. Again, Zuzana spent the winter close to the place she resided a year ago. A new expedition left Prague to explore her winter habitat. Unfortunately, the crew found Zuzana dead (she got killed by local vandals); then, the expedition continued exploring black stork winter habitats. Oscar spent most of the winter time in the very eastern part of Central African Republic. In spring, only Kristyna returned to Bohemia. This time, her way back to Central Europe was successfully traced, too; Oskar's life ended tragically in central Egypt. In the third survey season (1997/98), four black storks left Bohemia for their winter habitat. Again, Kristyna was there (she became the world's record holder - migrant bird followed for the longest period of time) together with her nest-mate Jakub, female named Tereza, and male named Martin. Kristyna flew to the same destination as she did before - she spent the winter time near Khossanto (Senegal) while her "husband" stork Jakub reached Nigeria along eastern route (his transmitter broke down; next report concerning Jakub was registered in February, 1999. It announced his death near Nigerian town of Bauchi). Martin used western route just like Kristyna did and he spent the winter time in Niger river basin in Mali. Tereza died in October in the Antiatlas mountain range in southern Morocco. Thus, only two storks returned to central Bohemia next year: Kristyna and Martin. Kristyna found a new partner for nesting season. They built a nest in the Brdy hills close to the site she had resided previously. The nest was literally open to public, as from May 21 to August 15, an image recording of the nest was transmitted LIVE on the Internet. The stork parents took care of 4 babies (3 of them survived long enough to leave the nest). Later on, the babies' DNA was subjected to an analysis. Thus, they were proved to be males. The babies were named Ondrej, Hynek, and Jonas. Just like Kristyna and David, the babies received their own satellite sets. With the fourth survey season (1998/99), the plan was originally to follow migration of the entire black stork family. However, Ondrej's satellite transmitter failed to work in August, Hynek was shot to death in south-western France, and Jonas got intoxicated in western Bohemia. As it was necessary to capture him, he was cured, taken to southern Spain on board of an airplane and loosed free. Both parent storks left the nesting site together and flew to eastern France. Kristyna then flew further to her usual winter habitat in eastern Senegal; David spent the winter time in southern Spain (see Storks on line 1998/99). In spring 1999, David appeared in the Brdy hills with a new female stork. He was the only one of the whole family we followed during last season. Kristyna died in Senegal (south of her winter habitat), probably being killed by a predator. Her communication set was found in April in a waste bush area (it had been probably exposed to fire). Jonas spent the whole summer time in southern Spain. A vandal hunter probably killed him as the hunting season began. During the fifth season in a roll (1999/2000), we tried again to follow a black stork family. This time, the birds were found nesting in the Rakovnik region. The couple of male stork Krystof and female stork Dominika has been monitored during the nesting time (see the video recording) while taking care of three stork babies: Otakar, Karel and Vaclav (all males). Early in July, a female stork named Sissi has been put into the nest. Sissi was born in Alpenzoo, Insbruck (Austria). Krystof and Dominika left the nest on their own, heading in southwestern direction. The babies left the nest together; however, Karel's transmitter had been already malfunctioned. After a short period of time, Sissi's transmitter went dumb, too. Otakar and V�clav were flying in southwestern direction. Krystof reached his winter habitat near the Karakoro river (Mauritania/Mali border territory), Dominika stopped temporarily in south Mauritania. Otakar's journey was no longer possible to track, he probably spent late October in north-western Africa. Vaclav left Germany heading southeast and flew across the Adriatic Sea (!). Then, he was shot to death in southern Italy. 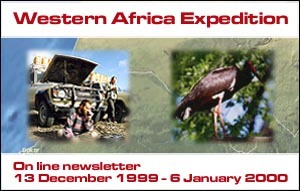 In December 1999 an Expedition crew of the Czech Radio station tracked female stork named Dominika in southern Mauritania near the Maghama town. Together with her, at least 75 black storks were registered within a rather small area in flood-zone of Senegal River; this gathering of black storks represented the most extensive winter habitat found during the entire African Odyssey project. The storks were hunting alone or in small groups, they gathered near a lake in the morning and after the sunset, they spread all around to spend the night. A bit later, the expedition monitored Krystof; he moved to western Mali in December. He was residing close to a dry river bed with another black stork. In January, one of the satellites captured Otakar's signal after a three-month pause; he was located in western Africa. At the end of January, Krystof flew far south from his winter habitat - he reached Sierra Leone. Dominika was heading south in late February, as well. The satellites located her in eastern Senegal. Krystof got on his way home on the 2nd of March and he was proceeding real fast, especially in African territory (he had flown awesome 488 km in a single day). Thus, he reached the Rakovnik town area as soon as April the 1st. Two weeks later, Dominika was located close to him. They biult a nest together; however, the nest collapsed with at least one egg inside of it. 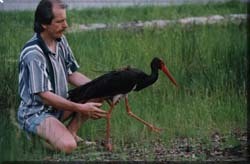 In the sixth season in a roll (2000/2001), black storks and white storks (Ciconia ciconia) were tracked in the project. Two young white stork females have been marked at the nest in the Dvur Kralove ZOO. The both left the nesting spot on the 18th of August and chose the eastern way of flight. Marta reached southwestern S�d�n as early as on the 6th of September. Unfortunately, Zofie died on an electric line in Turkey. Black stork male Krystof (he was observed during last season as well) flew across the western path; however, his transmitter failed to work when he reached southern Morocco. Young black stork female named Johana was marked in the Brdy Hills area and she got on her way in south-eastern direction. This text was last updated in September 2000. Supported by the company Internet servis, a.s.